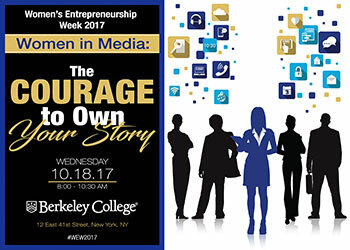 In honor of Women’s Entrepreneurship Week, Berkeley College is hosting a special event in at Manhattan, NY, on October 18, 2017, featuring panel discussions with prominent women leaders. Women in Media: The Courage to Own Your Story will discuss how women are shaping the news landscape, how small businesses can stand out by sharing their stories, and how entrepreneurs can develop and protect their digital presence. TO REGISTER: This event is open to business and community leaders, aspiring entrepreneurs, and students interested in gaining knowledge and resources to advance their voices through media. While admission to the event is free, registration is required and space is limited. Click here to register for this event. For more information about attending, please contact Kelly Depsee, Associate Director, Communications and External Relations, Berkeley College, at KME@BerkeleyCollege.edu. - Monica C. Smith, CEO and Founder, Marketsmith Inc.
MEDIA CONTACT: Press inquiries can be directed to Zachary Shaw, Senior Media Relations Associate, Communications and External Relations, Berkeley College, at Zachary-Shaw@BerkeleyCollege.edu or 973-278-5400, EXT. 1-1644. To view a high-resolution version of the above graphic, click here.